When I was building out my Iron Warriors army, I wanted to create a protector squad for the Warsmith. 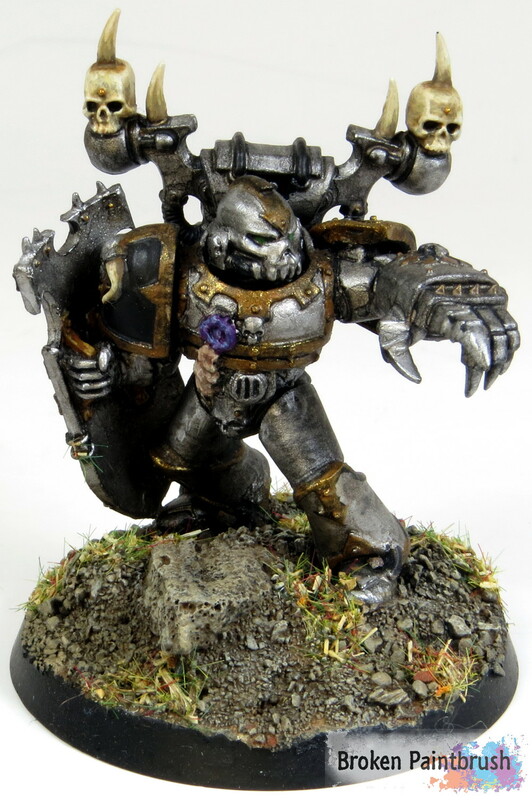 I felt that Iron Warriors Chosen wouldn’t be full of mutations and craziness since they disdain the weakness of the flesh. So instead, I took bits from the Chaos Knights and built a custom squad with force weapons and storm shields. While this load out does not exist in the Chaos Codex, with the new flexible way Games Workshop is building out the armies, I have played these as Wolf Guard or even Honor Guard. 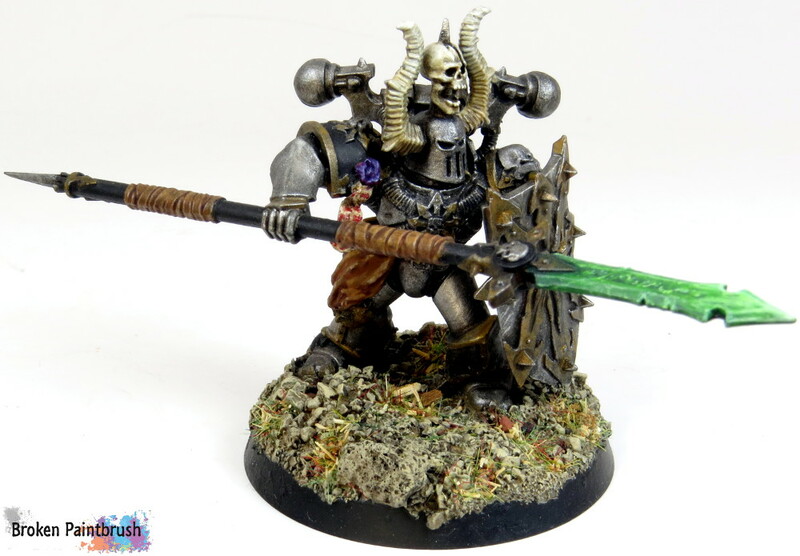 , but the arms are from the Chaos Knights for fantasy. To also help set them off as special, they are on the 40mm bases as well with some added height. The selection of shields from the kit is fantastic and a good mix. 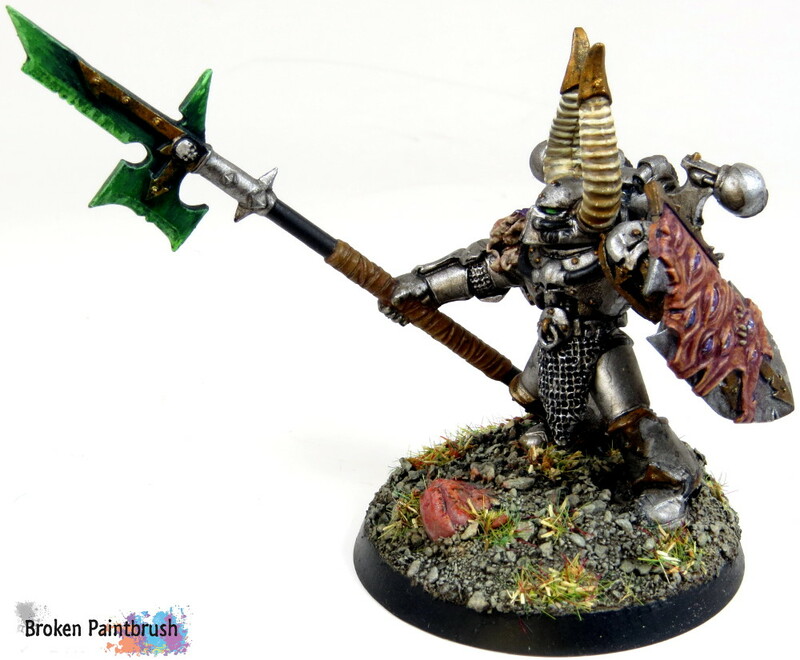 The champion’s shield was actually from the Juggernaut Lord that I used for the base of my Warsmith, but since he wasn’t using it, I added it to his Champion. As fitting of a Champion, he is pointing out his next target with a power fist. You can also see his honor roll made with green stuff pinned to his chest. 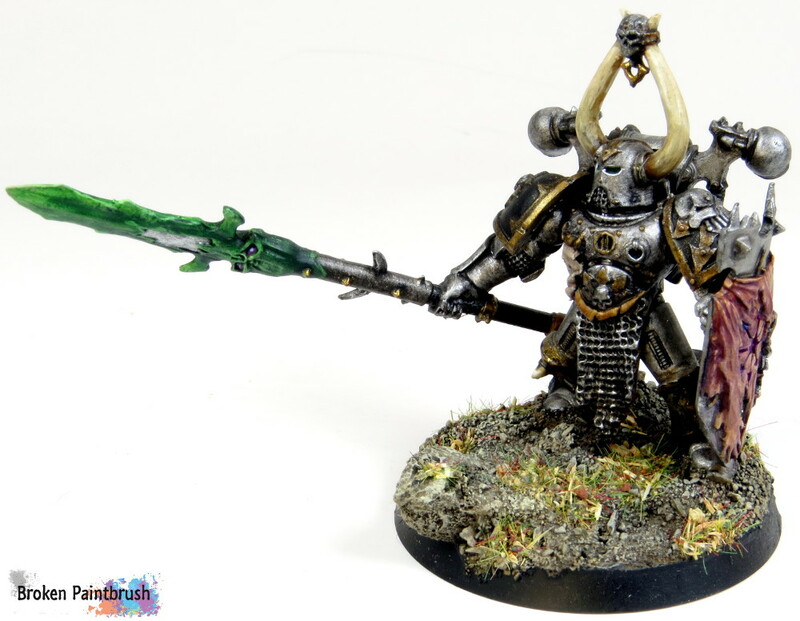 Some of the warriors also used the heads from the Chaos Knights as well which fit in so nicely with the Chaos Space Marine look. Here, I liked the chain mail on the face mask and the loin cloth. The demon face shield is probably my favorite and adds a good deal of color to the squad. I also added a few extra strips of leather to the top of his spear to create some motion. I wanted to make the shields and spears a part of the movement of the models and the one above really demonstrates that idea. The shield of eyes follows up as my second favorite. I also liked the more halberd look of this weapon. At his feet is a Blood Angles helmet, a common opponent at the time. I had also spent a good deal of time building up the bases and adding some good interest in textures and height. 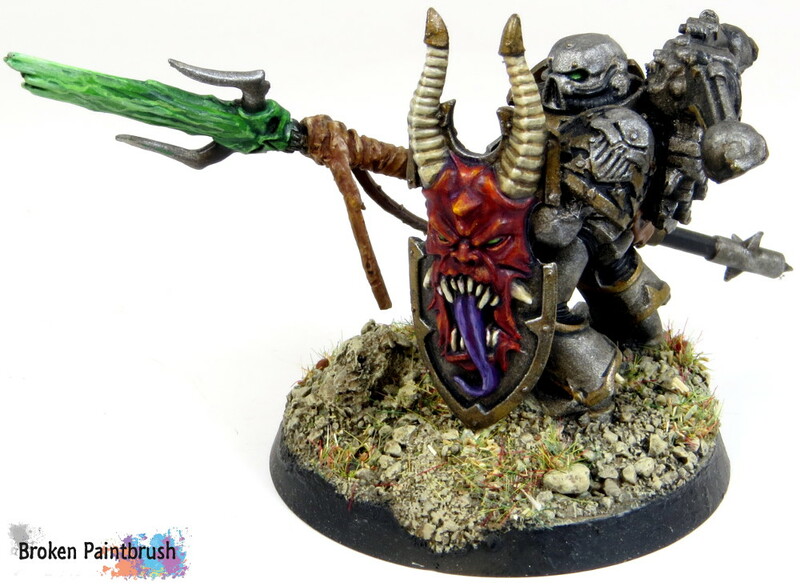 I used this squad to make my painting tutorial for how to paint Iron Warriors.